Who says children and Michelin-starred chefs can't play well together? Alec Le Sueur and his kids prove otherwise at a cooking school in England. It was a difficult decision. when should we tell our food-obsessed children that they were about to go on the trip of a lifetime? We waited until a week beforehand to break the news. "We are going away for a long weekend to the countryside outside London to meet Monsieur Raymond Blanc, one of the world's top chefs, and you will learn to cook for a day in his special school," I told them. "We will stay in his wonderful hotel and eat in his restaurant, which has held two Michelin stars for over 20 years. Then we are going to eat at a restaurant called the Fat Duck, which has three Michelin stars." There was silence. Ruben, our seven-year-old, screwed his face up. "We're going to eat a fat duck? We're going on vacation to go to school?" Hannah, our 10-year-old, corrected him: "Cooking school! Michelin stars!" Ruben's expression changed as the message sunk in. "Can we go today? Please! Please!" Television chefs have turned my children into enthusiastic cooks who regularly help in the kitchen. One morning before we left on our trip I found Ruben watching Jamie Oliver. "Wouldn't you rather watch cartoons?" I asked him. "No," he replied. "Jamie's just adding asparagus to a tray-baked sea bass. It looks yummy." The next week, despite the early start, the children could barely contain themselves as we drove to the sleepy village of Great Milton, deep in the Oxfordshire countryside an hour northwest of London. A small road sign led us to Le Manoir aux Quat'Saisons, home to Raymond Blanc's hotel, restaurant and cooking school. In the parking lot we encountered a giant bronze artichoke, the first indication that Le Manoir would be fun for children. Although the 32 rooms are full of art and antiques, everything is safely out of harm's way. Hannah and Ruben were as relaxed in this setting as the grown-ups were. Blanc is the first to admit that the idea of opening his hotel and cooking school to children did not go unchallenged. "I had to fight travel writers, my managers, everyone who asked why I should invite little hooligans into this temple of gastronomy, this temple of peace! Everyone thought I was crazy!" But once Blanc has a vision, he is not easily deterred, and three years ago he began offering children's cooking classes, what he calls La Petite Ecole. The one-day courses, usually offered in April and August, are available to children between the ages of seven and 16. "Parents are not with their children enough," Blanc lamented, explaining why adults should bring their children to Le Manoir. "I am a Frenchman and a strong family is part of my culture." On the evening we arrived, we took our seats in the restaurant with everyone promising to be on their best behavior. The notice on the menu, "Children are not only accepted but welcome," was a good sign, and we knew we were on solid ground when a children's menu appeared offering dishes like tomato-basil soup and fresh pasta. The grown-ups chose the nine-course tasting menu. This had the slight drawback of outpacing the children's meal, and by the time Ruben's dessert arrived, he was sound asleep. Comatose. Not even a whiff of chocolate mousse could wake him. Hannah gave us her verdict, that it was the most delicious dinner ever. "I'm sorry, Mummy, but it's better than your cooking. You are just a one-star." We'll have to live with that. We were back in the restaurant for breakfast the next day, busy spotting other boys and girls bound for the school. A helper came to collect us, then whisked us through the main kitchen to a room set up for the children. Parents would normally wave good-bye at this stage, but I stayed to observe as each of the eight children donned a chef's jacket, tall chef's hat and maroon apron. Although Blanc is involved in the minutest detail of Le Manoir, he does not usually teach the courses, and today chef Vladimir Niza was in charge. Vlad, as he asked to be called, started by lobbing eggs one at a time to the children. He asked who knew what was special about organic eggs. Ruben's hand shot up. "Eggs that aren't sprayed?" And free-range eggs. "Eggs that are free?" Hannah gave him a don't-embarrass-me older sister stare. After an unfortunate incident involving a tossed egg and Hannah's catching ability, the children teamed up in pairs to make pasta dough and focaccia dough. Through a fit of giggles, Ruben's teammate and newfound best friend, Craig, enthusiastically karate-chopped the focaccia dough. While the dough rested, the children took a tour of the gardens, which include a Japanese Tea Garden, a newly planted mushroom valley and a large organic kitchen garden. The children darted in and out of the rows while tasting herbs and gathering ingredients for the afternoon's lesson. Back in the kitchen, they put on blindfolds for their next game, an exploration of the five senses. They passed around a cinnamon stick, a Chinese gooseberry, a raw langoustine. I don't recall terror being one of the five senses, but Victor the Shellfish certainly caused a stir. When the pasta dough was sufficiently rested, the children watched as Vlad demonstrated how to run it through a hand-cranked pasta machine to form tagliatelle. Having used this kind of machine once at home, and nearly thrown it through the window in frustration, I was doubtful the children could master it. But little by little, each pair was soon making perfect pasta. During the final lesson of the day, making chocolate mousse, melted chocolate was soon everywhere—on clothes, on faces, in mouths. Reluctantly, the children put the dessert aside to cool and turned their attention to the focaccia dough, which they transformed into pizzas just in time for the return of the parents. After the certificate ceremony, there was one activity left: eating the chocolate mousse. The parents left with eight very happy little boys and girls, leaving behind one exhausted chef. The next day we took a road trip to Great Missenden to the new Roald Dahl Museum and Story Centre, dedicated to the author of Charlie and the Chocolate Factory. Our children have long been fans of his, and since Johnny Depp's appearance in the recent film adaptation of the book, they have been reading little else. Among the exhibits at the museum are Dahl's writing hut and the peculiar objects he kept on his desk (a carved grasshopper, his own hip bone!). After a tour, the children each received an "ideas book" to use for jotting down stories. They ran from room to room writing poems and even making an imaginary film. The highlight was the discovery of a pair of giant Wonka chocolate doors (fake, of course) that concealed a little machine spraying a heavenly chocolate aroma into the corridor. Another fun, although somewhat more expensive, activity near Le Manoir is a trip to the village of Bray, where we headed for lunch after the museum. Bray is home to two Michelin three-star restaurants, Michel Roux's Waterside Inn and Heston Blumenthal's Fat Duck. Blumenthal is famous for his interest in molecular gastronomy—borrowing equipment, ideas and ingredients from the science lab to create startlingly new taste experiences. (Long ago, he spent just a week working at Le Manoir—he got fed up chopping vegetables—but Blanc remembers him well and described him to me as "a great master.") Interestingly, Blumenthal's first book was aimed at involving children in the kitchen. Things did not start well. We got lost on the way to Bray. It is a tiny, picture-postcard village that looks, when you are lost and late for lunch, very much like every other tiny, picture-postcard village in this corner of England, with a main road called High Street, a village green, a church and two pubs. The children argued nonstop in the back seat and both were in a foul mood when we eventually found the right High Street and stepped through a very unassuming door into the Fat Duck. The low-ceilinged room, with exposed oak beams and walls lined with modern art, was packed with couples on food pilgrimages. There was not another child in sight, nor was there a children's menu. Ruben and Hannah sat tight-lipped, glaring at us. I gingerly read off the menu: "Smoked bacon-and-egg ice cream? Sardine on toast sorbet? Snail porridge?" Ruben slumped across the table and declared in a loud voice: "This is disgusting! I'm not eating anything!" After some quick thinking, we announced that there would be a magic show. This seemed to perk them up, although Ruben muttered under his breath that he couldn't see a magician anywhere. Our waiter returned full of smiles, pushing a trolley with one of Blumenthal's signature dishes: nitro-green tea and lime mousse. He picked up a soda siphon and squirted an egg-shaped dollop of mousse into a bowl of liquid nitrogen, which is kept below -320 Fahrenheit. Vapor from the liquid nitrogen ran over the edge of the bowl and cascaded down to the floor. The children were impressed—they had never seen anything like this in a restaurant before. The first dollop of mousse was "cooked" after a few seconds and, resembling a little meringue, it sat on Ruben's plate. He popped it in his mouth and his eyes opened wide in amazement as the meringue shattered, releasing the flavors inside. Another starter arrived: mustard ice cream in a red-cabbage gazpacho. I worried that this dish could be a setback, but the children were getting into the spirit of the place. "It's different," Ruben announced. "Good different. I don't like mustard, but I like it this way." "It's cold but it tastes spicy hot," Hannah added. "Can you make this at home, Dad?" They gave the mustard ice cream a nine out of 10. By the time we got to the coq au vin, made with organic Bresse chickens, the children had become devoted Blumenthal fans. The singularly silky mashed potatoes served alongside had been created by cooking the potatoes at precisely 160 degrees before plunging them into ice water, cooking them again, adding butter and passing the puree through a fine sieve. Twice. Hannah declared them the best mashed potatoes in the world. Ruben's only comment was, "This is a billion out of a million." Raymond Blanc is very proud that he has trained more than a dozen Michelin-starred chefs. I looked at our children examining their butternut squash ice cream with carrot and pumpkinseed oil. They prodded it, tasted it and asked for the recipe. 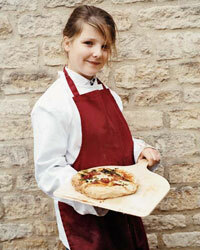 Who knows, perhaps Raymond Blanc will have two more protégés to be proud of one day. Alec Le Sueur is the author of The Hotel on the Roof of the World: From Miss Tibet to Shangri-La.